Enigmatic. Immortal. Selfish. Mercurial. Human. Love her or hate her, the Princess of Freedom is a mover and shaker of In Nomine's Hell. Underestimate her, misunderstand her, and she'll take advantage. 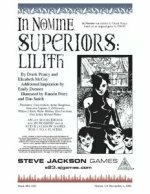 Now the GM can also take advantage, with In Nomine Superiors: Lilith. What's it like to know your only safety is in your net worth? How do the Free Daughters stay that way when their Mother's protections are thin and tenuous? And what happens when a Daughter of Lilith redeems? 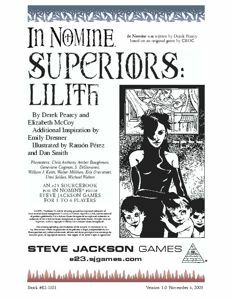 With information about the Princess and her plots, her servants and Daughters, as well as Geases and GURPS Third Edition conversions . . .
You Need this. You Need . . . Lilith.